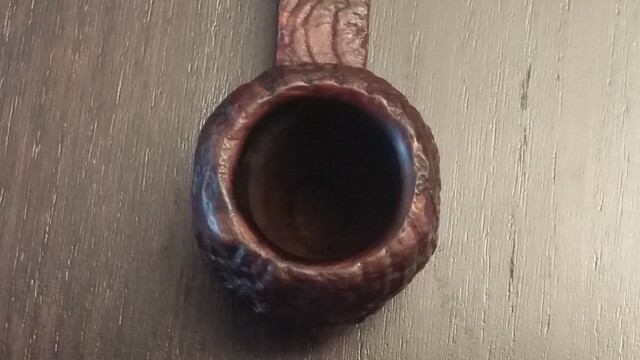 I picked up this pipe at a local antique market for not much money. I think the condition of the piece had scared off more than a few potential buyers, so the seller was happy to make a deal with me. 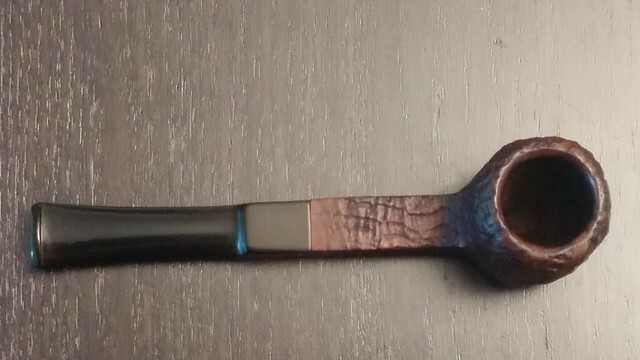 The pipe had been well and truly enjoyed by its previous owner – the chamber was jammed nearly full of old smelly carbon cake, and the sandblasted rim was choked with lava as well. 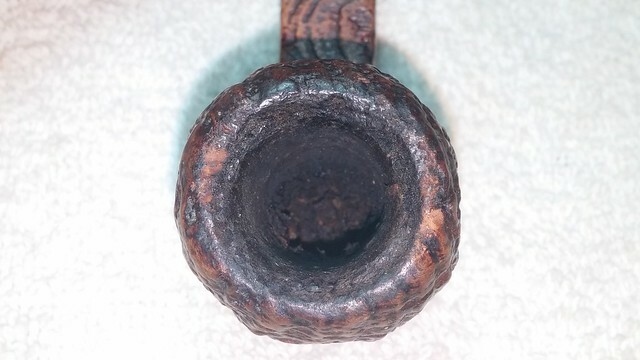 The exterior of the stummel was about as dirty as it could get without actually trying; the crud partially obscured the stamps on the square shank, and rounded off the corners of the octagonal panel bowl. The stem was well oxidized, but there was only a bit of tooth chatter present, and no larger dents. 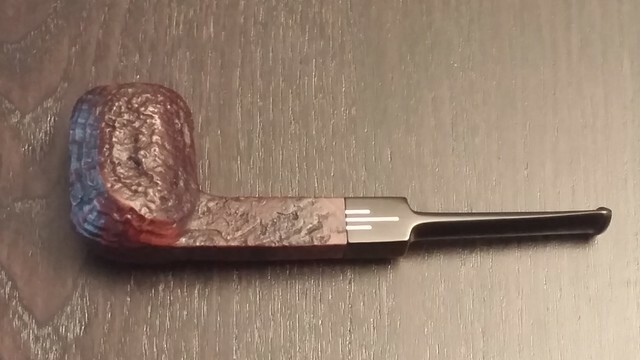 I may have passed on the middling-sized pipe myself if not for the three-bar inlay on the stem that identified this pipe as a Comoy’s product. 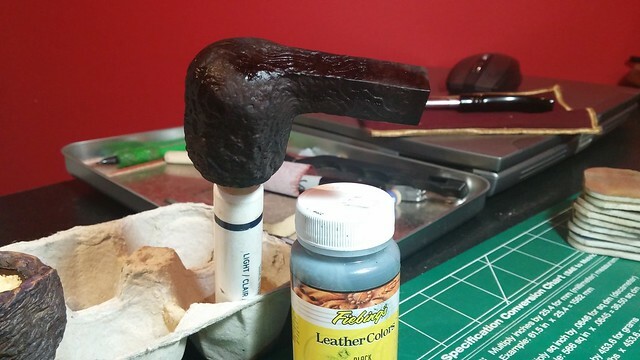 I wiped the flat stamped area of the shank with alcohol on a cotton pad when I got the pipe to my worktable. This cleaned the accumulated dirt from the briar and allowed me the first good reading of the stamps. 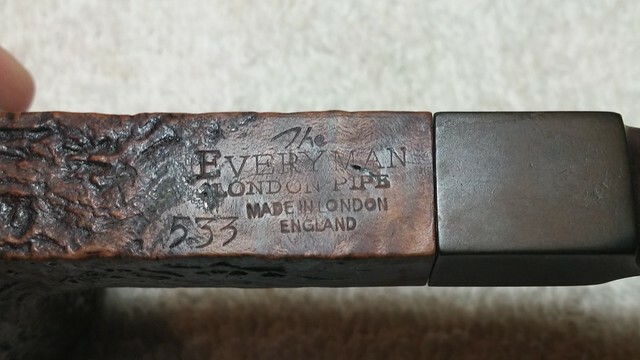 The pipe is stamped “The” over “Everyman” over “London Pipe”, then “Made in London” over “England”, and finally a shape number “533”. 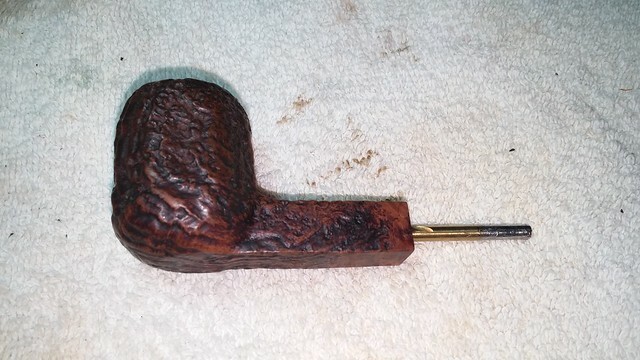 Shape 533 is missing from the Comoy shape chart on Pipedia.org, but I found another example of the shape on SmokingPipes.com, this time in a Comoy’s Golden Grain finish. 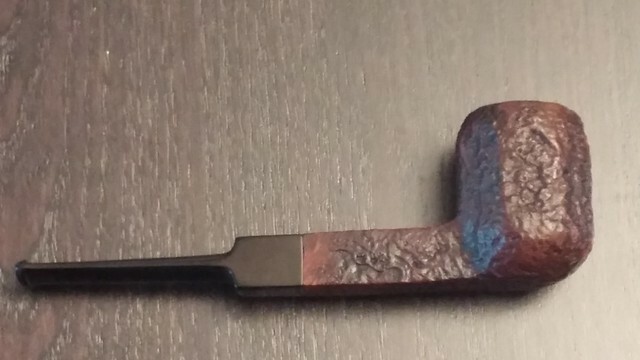 If the stampings weren’t enough, the comparison of this Everyman to the Golden Grain certainly confirms the pipe’s lineage..
After working on so many freehand pipes lately, this Everyman billiard seemed small in my hands, but it’s actually an average size at 5.25” long and a bowl approximately 1.6” high with a 0.75” chamber diameter. Getting started with the cleanup, I twisted the stem out of the shank to find the original stinger in the end of the tenon. 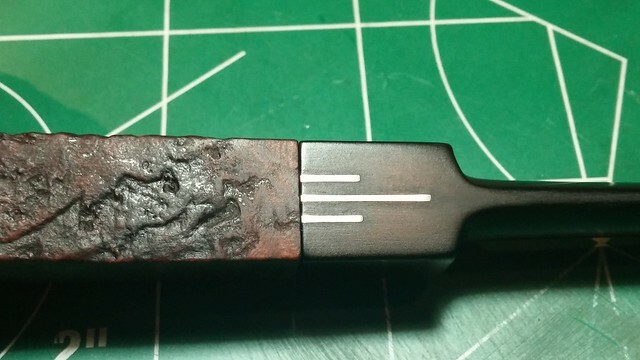 It was just as dirty as I had expected, given the state of the chamber, and firmly glued into the tenon by all the old tars. 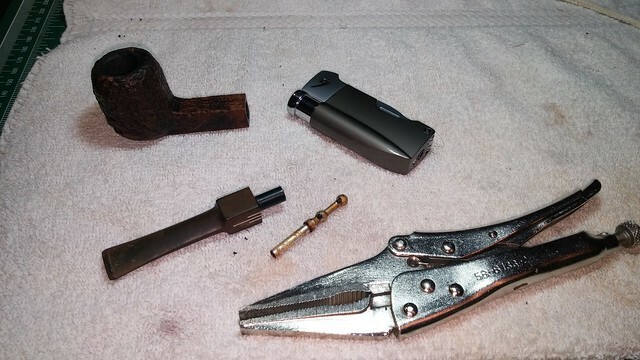 Unable to free it by hand, I heated the stinger over a lighter flame until the tars loosened and I was able to twist the stinger out with the help of a pair of pliers. 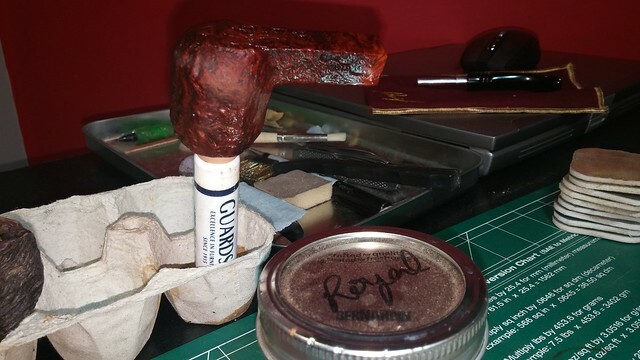 My Castleford reamer, fitted first with the smallest cutting head and moving up in size as necessary, made short work of the mass of cake in the tobacco chamber. The cake was fairly soft until I reached the bottom of the bowl. That patch of carbon had compacted and was a bit more of a nuisance to remove. My worktable looks neat and clean in the pics below as I reamed the bowl directly into a garbage bag. I knew if I didn’t, I’d be wading through a nice mess on the desk. 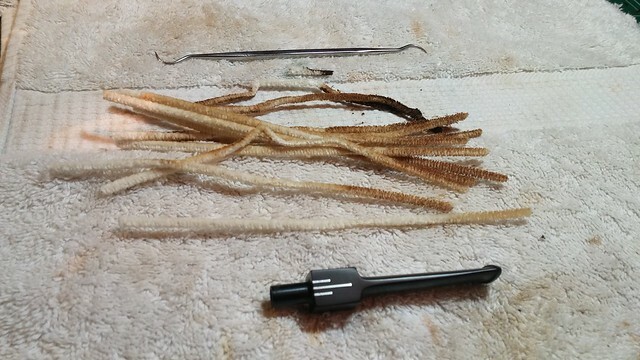 Knowing the buildup of crud waiting for me in the pipe’s shank and airway, I used a drill bit, turned by hand, to auger out the worst of the tars and other goodies before turning to pipe cleaners, cotton swabs and alcohol to get the internals clean. 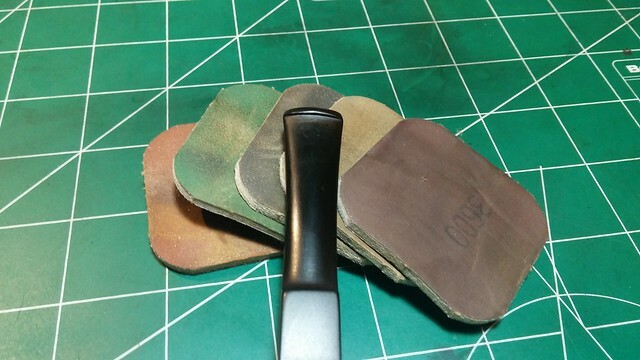 I made good use of the squared-off end of a needle file to scrape a lot of heavy tars from the end of the mortise. The black crud in the foreground of the pic below is the result of my scrapings. 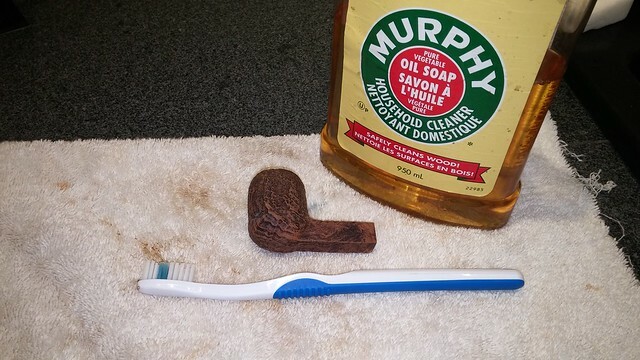 With the stummel clean on the inside, I used Murphy’s Oil Soap and a toothbrush to scrub up the outside of the stummel. 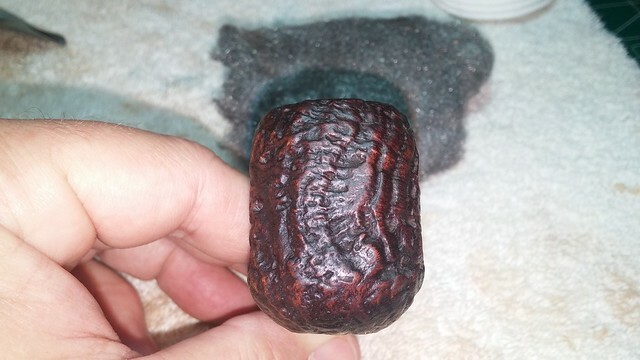 This cleared the dirt, wax and oils from the dips and hollows of the sandblast finish as well as the tarry lava from the rim. Then Black dye over top. . 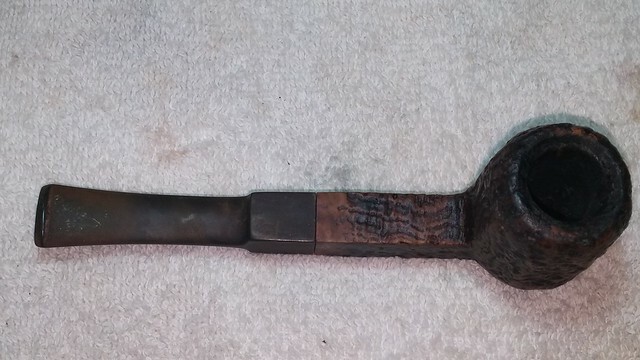 I wiped the stummel with mineral oil to see what the finished stummel looked like at this point. 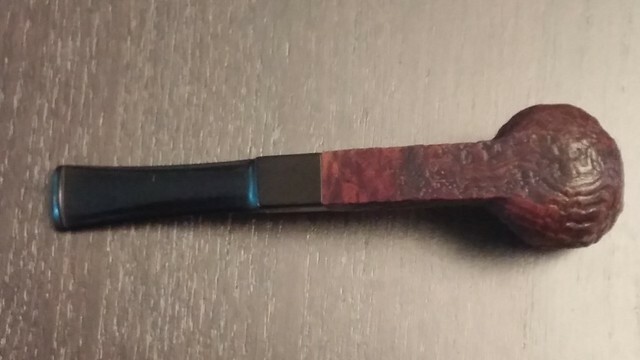 I wanted a bit more of the red colours shining through the black, so I rubbed the briar down with a bit of 0000 steel wool to strip the black from the high points. 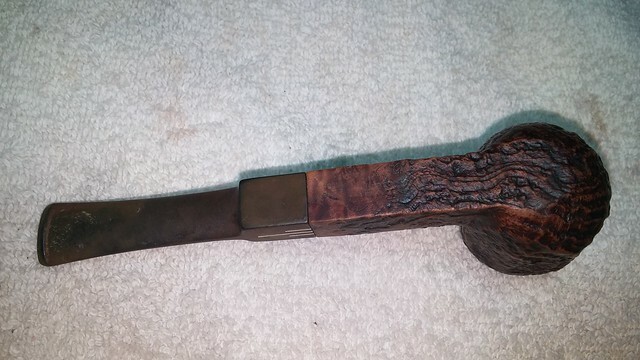 Happy with the finished stummel, I set it aside and went to work on the stem. Out it came from the Oxyclean bath for a scrub with Magic Eraser before I got into the main task of cleaning out years of tars and crud from the airway. I used a curved dental pick to scrape out the heavy buildup in the button slot, and then pipe cleaners and alcohol to finish the job. 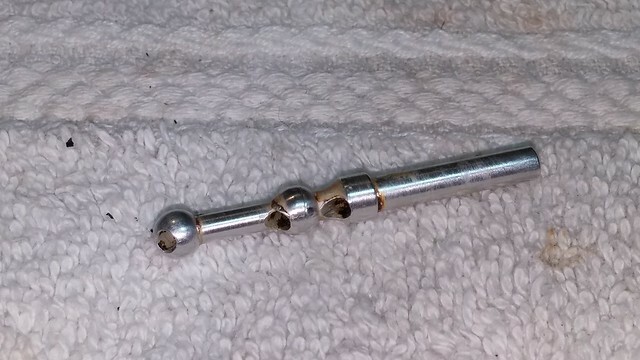 I also cleaned the stinger. 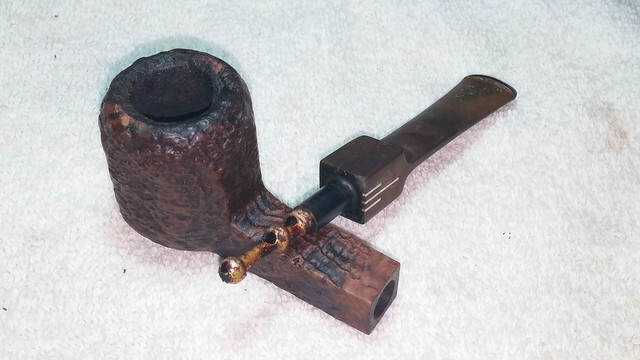 I finished off the stemwork with a light polishing with micromesh pads and then reassembled the pipe and snapped a few pics. 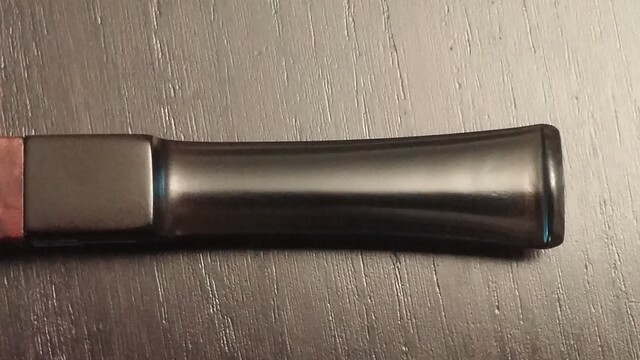 The face of the stem is slightly worn at the corners, creating a few tiny gaps where the shank meets the stem. 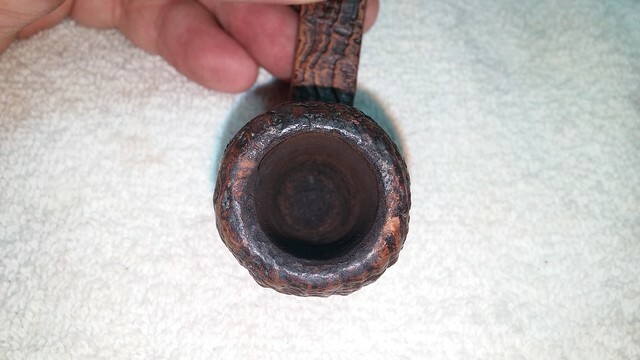 The pictures emphasize the rounded corners, but in reality the gaps are small enough to be missed on casual observation so I decided to leave well enough alone and allow the pipe to show its age and mileage a bit. 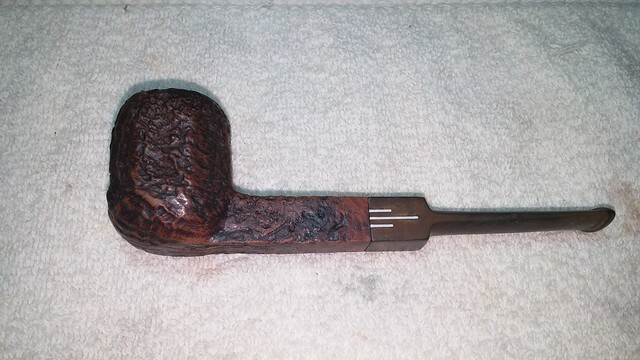 All that was left to do was to take the pipe to the buffer for a run of White Diamond compound on the wheel and a few coats of Carnauba wax to protect the new finish. 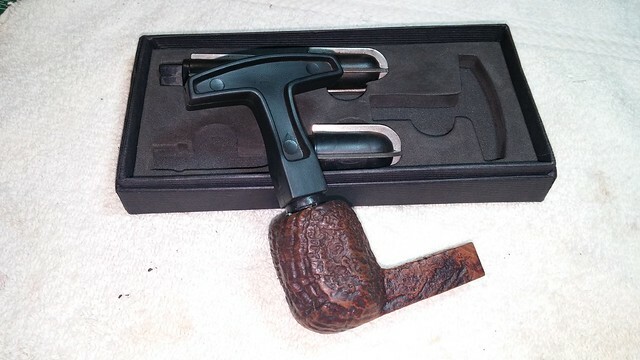 This Comoy’s Everyman, refreshed and ready to accompany a new piper wherever life may take them, promises to be a great smoker and a stalwart companion for decades to come. Look for it in the DadsPipes Store; it would be a fine addition to to any piper’s rack and rotation. Truly amazing job on the estoration, impressive restaining ! Actually pipes this dirty do not scare me of easily. On the contrary, I often found that a massive cake preserved the interior of the bowl from burn throughs, stress cracks, spider webbing and so on. I sometimes put the stem in the freezer for half an hour or so; the singer will come out effortless. Funny how many of your first pictures make me say, “Ugh”; then the finished pictures make me say, “Nice”. I didn’t know The Everyman was a Comoys’ pipe. 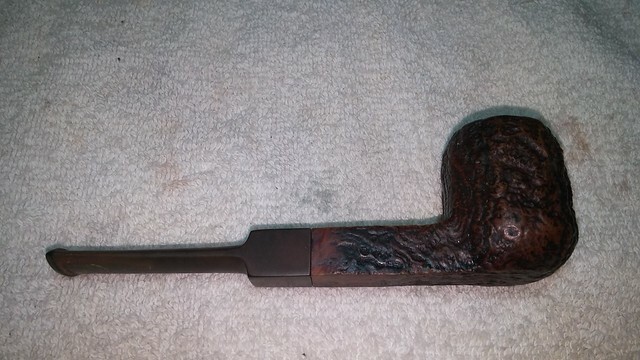 There was an Everyman billiard in the lot I bought at Keady. 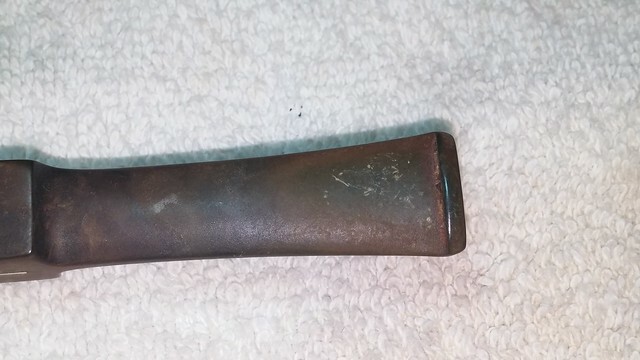 It was in great shape and cleaned up nicely. 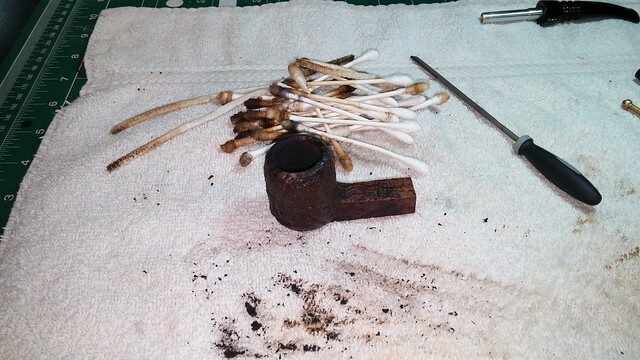 They are well made pipes, solid, and smoke great. It’s one of my top four. The three metal inserts on the stem make them easy to identify. Great work, Charles. I agree, David. These are good, solid all-around pipes that were built to last, unlike some of today’s budget offerings. I’ve seen more than a few of these “seconds” and wondered what possibly kept them from being “firsts”. Nice grab. I’m always amazed at the level of detail Comoy’s put into that stem logo fo a 2nds line.